or What Took Them So Long? A quantity of stone crushed by S. M. Eaton's crusher is being placed on portions of Main Street. It is thought to be just the thing for an excellent road-bed. The work of paving Main Street is now progressing more satisfactorily and Contractor Schoenlaub is confident he will have the brick laid as far as the bridge before carnival time. The first block west of College Avenue is about finished and the concrete bed is laid to Sixth Street. More labor could be used on the paving to advantage. Miss Kathy Schmutzler, daughter of Mr. and Mrs. O. E. Schmutzler, Jr., of 407 Hancock Street, has been named “Miss Watertown” and will reign over the Main Street reopening parade on Saturday. Miss Schmutzler won the title by selling the largest number of Watertown Booster buttons in a contest which was underway here the last several weeks. Runners up in the contest were Cheryl Schwanke, Joan Dehnert, Beverly Niemi, Wanda Bruske, Janice Reinhard and Diana Inlow. All of the contestants will ride in Saturday’s parade. Miss Schmutzler is a licensed practical nurse at Watertown Memorial Hospital. 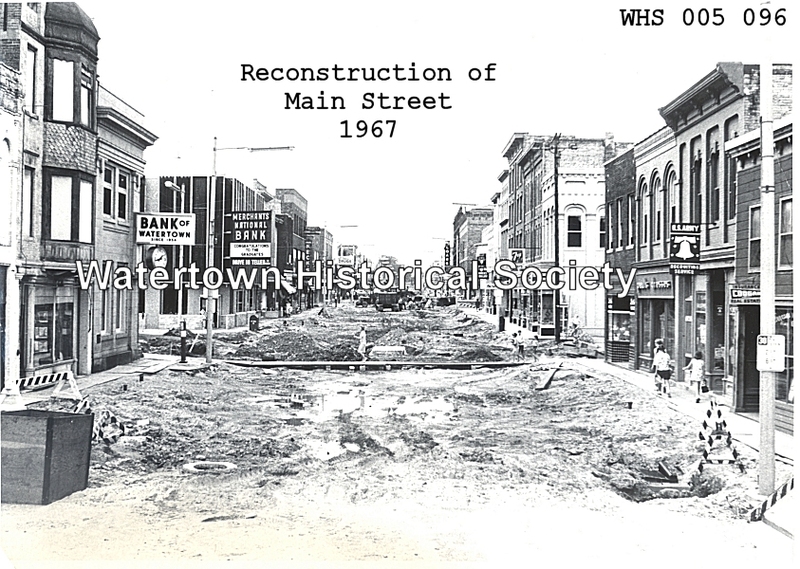 Watertown tomorrow will launch its Main Street reconstruction celebration with a three-day merchandising event, a carnival, street dances and the coronation of Miss Watertown and a “Big Parade” with 132 units on Saturday. The celebration marks the city’s biggest downtown improvement project, the virtual rebuilding of 15 blocks of Main Street which was underway for months. Saturday night there will be three street dances, with popular bands and one strolling band. One of the dance areas will be in West Main Street, the other two on the east side. The day Watertown has been waiting for through a long summer arrived today and was celebrated with a giant parade viewed by thousands of people from the city and far and near — marking the “opening” of the city’s newly reconstructed and improved Main Street. The weather was ideal, bright sunshine flooding the city, a breeze caressing the United States flags from poles along the line of march. The parade was inaugurated by the cutting of a ribbon at West Main and Church Streets by Mayor A. E. Bentzin and the coronation of Miss Kathy Schmutzler as “Miss Watertown” in the person of Barbara Burk Baugh of Brookfield.